Description: Interior view of Watermark Books, 149 North Broadway Street. Store opened at this location in 1977 but moved its retail operations in 1994. View from mezzanine looks east. Keywords: Wichita, business and industry. Description: View looking east toward J. P. Weigand & Sons real estate firm's downtown offices, 150 North Market Street. 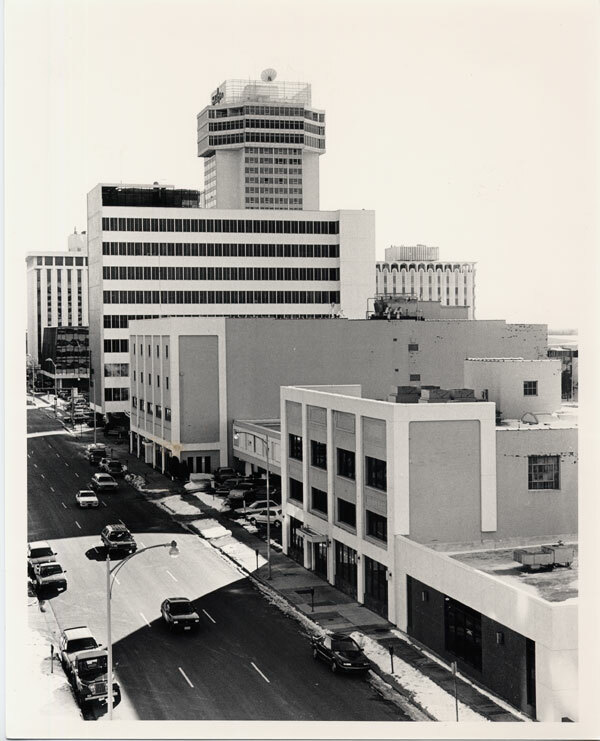 Southwestern Bell building at southeast corner of 1st and Broadway streets in background. Keywords: Wichita, business and industry, street scenes. 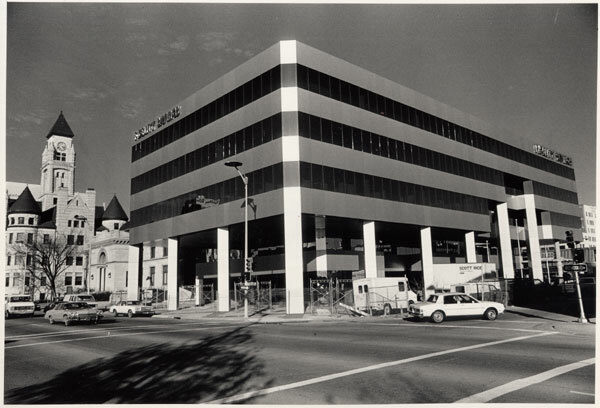 Description: View of Corporate Hills office building at southwest corner of Douglas Avenue and Webb Road. View is looking northwest. Keywords: Wichita, business and industry, buildings. Description: Fireworks over Arkansas River in downtown Wichita. View looking east toward crowd along east bank of river. Century II Convention Hall, Garvey Plaza, Kansas State Bank & Trust Company building and Wichita-Sedgwick County Historical Museum in background. Partially completed Bob Brown Expo Hall adjoins Century II at right. Keywords: Wichita, public events, people, rivers, buildings. Description: Looking northeast at Fidelity Savings Association of Kansas building, under construction at 100 East English. To its left is the original Carnegie Library Building (later the Omnisphere & Science Center), at 220 South Main, and beyond, the original City Building (now the Wichita-Sedgwick County Historical Museum) is partially visible at 204 South Main. Keywords: Wichita, business and industry, libraries and museums, public services, street scenes, transportation, automobiles, trucks. 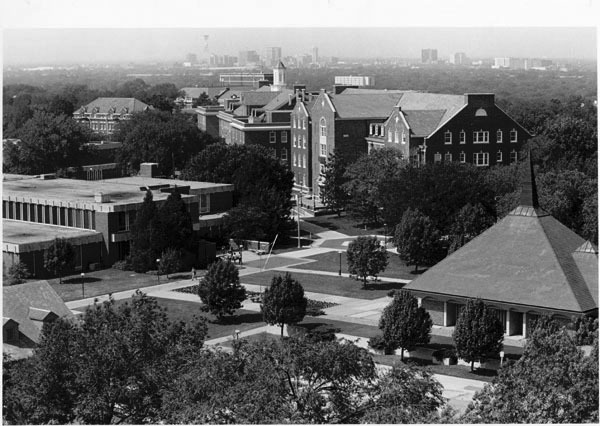 Description: View of Wichita State University campus looking southwest from Lindquist Hall. Shows Grace Memorial Chapel, Jardine Hall, McKinley Hall, Fiske Hall, Wilner Auditorium, Campus Activities Center (Rhatigan Student Center) and Alumni House. Skyline of downtown Wichita in distance. Keywords: Wichita, education, schools, Wichita State University, architecture, landscaping. Description: View looking east on Kellogg Street, also known as U.S. Highway 54, and its ground-level intersections with Main, Market and Broadway streets. Some businesses are Davis-Moore Oldsmobile, Spangles, Royal Lodge and Days Inn. Construction of elevated roadway eliminated these intersections in early 1990s. Keywords: Wichita, street scenes, transportation, buildings. Description: Bird's-eye street scene looking southwest at Water Street from Second Street. Keywords: Wichita, business and industry, street scenes, transportation, automobiles, cars.